This new resource from Miles summarizes the essentials of planning, designing and managing online advertising that works. 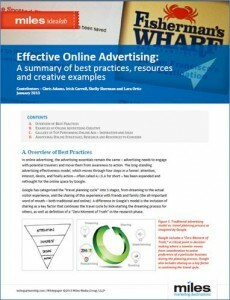 The white paper provides a brief introduction to six critical best practices including the design elements of effective online advertising creative and how to measure online advertising performance. It includes a gallery of top performing online advertising examples from a range of leading destination tourism web sites for inspiration and ideas. Download the White Paper - "Effective Online Advertising"
A range of additional resources are highlighted including leading research from Google and Nielsen.